Our range of 5 modular perimeter machine guarding systems all have different characteristics, and can meet any perimeter machine guarding requirement. Dependent upon your working environment we can support your operation by helping you to select the most appropriate type of guarding from our Strong/Heavy, Adapta, Basic, Green Fast and MDF systems. When selecting a suitable system, Warehouse Partners takes into account the guidelines in respect to the correct distances and heights from a machine or hazard so that your personnel are protected. Using a range of patented parts we have a simple system of panels and fixings that enable guards to be moved time and again without them becoming difficult to re-erect or reposition. The new modular Adapta system combines both the practicality of the MDF system and the robustness of the Strong/Heavy system. It is an ideal solution where there is a high risk of mechanical impact. Click here to download the ADAPTA data sheet or watch the ADAPTA video & the impact test. Using the same fast assembly clamps (or screws if preferred) the Basic system uses 40 mm x 40 mm posts and 20 mm x 20 mm framed mesh panels. Click here to download a datasheet or watch the Basic video & the impact test. Designed for super fast installation, this system consists of 30 mm x 30 mm framed panels, base plates with locking forks and an upper flexible coupling. Click here to download a datasheet or watch the Green Fast video & the impact test. Using a super fast system ‘without through screws’ the MDF range uses 40 mm x 40 mm x 2 mm posts and frameless mesh panels with mesh at 30 mm x 60 mm x 3 mm. Click here to download a datasheet or watch the MDF video & the impact test. Using fast assembly clamps, the Strong system uses 60 mm x 60 mm posts and 20 mm x 20 mm framed mesh panels. 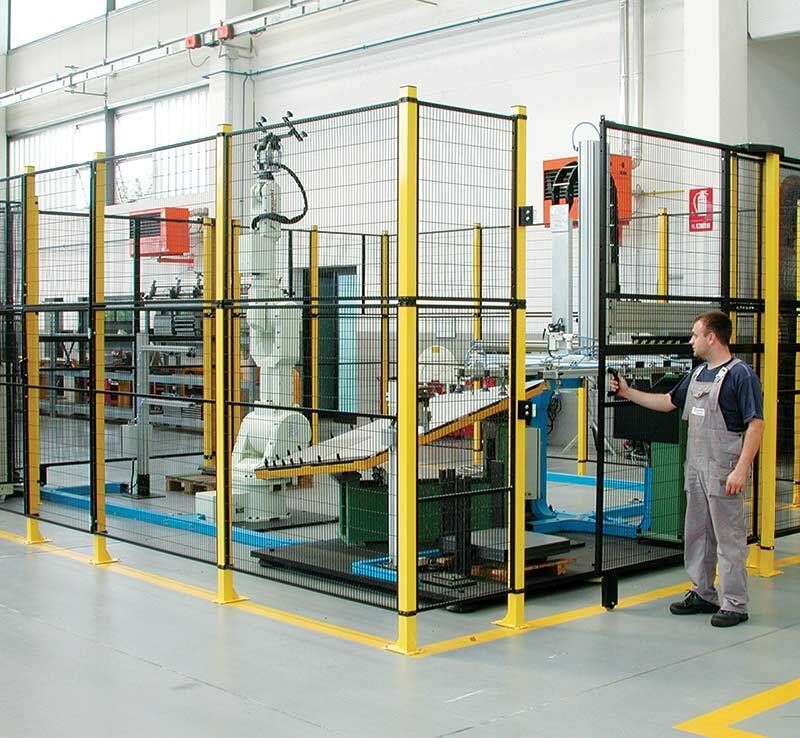 This system of perimeter machine guarding is ideal for heavy duty applications such as robotics, and steel fabrication machines. Click here to download a data sheet or watch the Strong/Heavy video & the impact test.